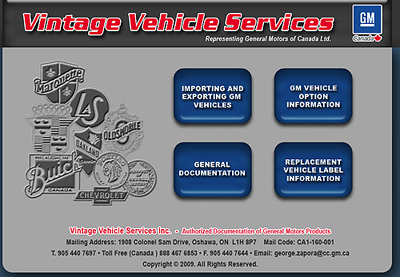 Vintage Vehicle Services can document the type of options, build date, original selling dealer, type of engine and transmission, a listing of all options codes and production totals for your specific GM vehicle. This documentation is possible due to the Camaro being built in Canada. They offer this Certificate on all GM vehicles 1964 or newer and a must have for the Camaro enthusiast. They have access to virtually all GM data so they can help you with most of your documentation needs For your Camaro ZL1 & 1LE. Please keep in mind That production totals are usually given at the end of a model year run. In order for Vintage Vehicle Services to prepare the documentation please fill out the following Request For Vehicle Option Information and fax it to there number on the bottom of the form. In the "Information Requested" field please put the specific information you are looking to find on the Camaro ZL1 & 1LE. The ZL1/1LE Registry fully supports this great professional service. If you want facts about your Camaro this is the place to go. This is documentation that you will keep and go back to for years to come. There is a Fee Vintage Vehicle Services charges and is between 75 to 80 US Dollars. The Canadian currency price is listed on the form.